AeroWave 300 PPE woven glass-reinforced ceramic UL 94 V-0 circuit materials present a strong value proposition for today’s designer where cost, performance and manufacturability are paramount. AeroWave 300 materials can be fabricated using standard FR-4 printed circuitry fabrication processes. The AeroWave 300 materials well suited for use in Hybrid multi-layer printed circuit configurations and are compatible for use in lead free assembly processes. AeroWave 300 materials exhibit excellent electrical and mechanical properties with a consistent and stable dielectric constant and dissipation factor over a wide range of frequencies (1 GHz to 20 GHz ) and temperatures (-40 ºC to +125 ºC). AeroWave 300 low loss, (0.0031 @ 10 GHz values) controlled dielectric materials (+/- 0.05) are available in a broad range of nominal cores and pre-pregs. These products have been developed to provide unique material solutions for base station antennas and base station power amplifiers and other current and emerging RF/Microwave design requirements. AeroWave 300 RF/Microwave low loss, controlled dielectric materials exhibit exceptional dimensional stability, chemical resistance, low moisture absorption, and copper peel strength. Passive Inter-modulation (PIM) performance values exceeding -158 dBc are typical (RTF and VLP type copper foils). For most application the standard EDC foil should be used. When PIM and insertion loss is critical, the RTF low profile copper foil should be considered. mmWave is designed for use in many of today’s demanding and highly challenging RF/Microwave design platforms that extend into the millimeter range. 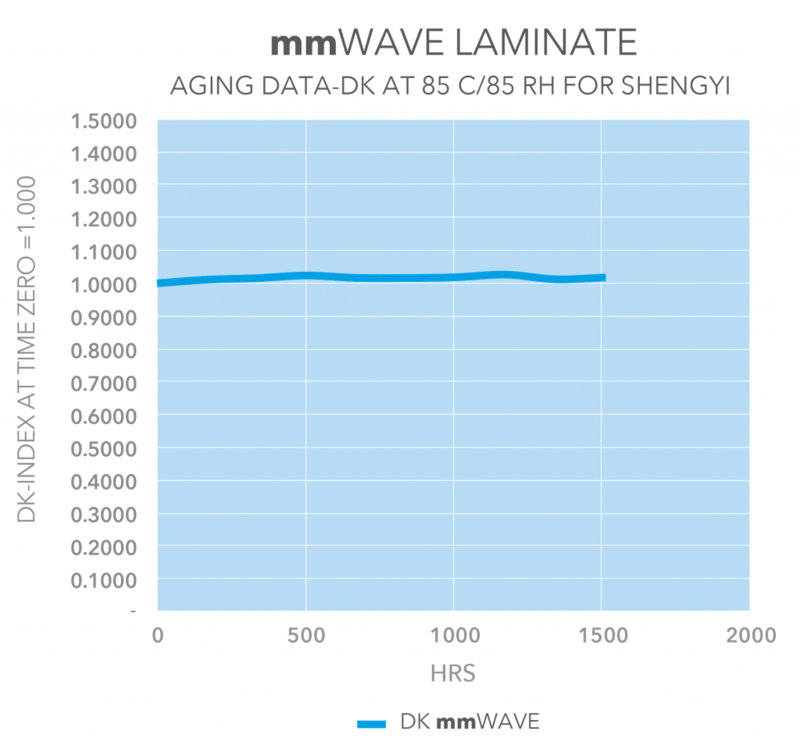 mmWave is a PPE Woven Glass Controlled Dielectric Material with excellent electrical and mechanical properties with a consistent and stable dielectric constant and dissipation factor over a wide range of frequencies and temperatures. mmWave exhibits excellent dimensional stability, chemical resistance and low moisture absorption. ½ oz. (18μm) HVLP copper foil. 1 oz. (35μm) HVLP copper foil. 2 oz. (70μm) RTF copper foil. Other claddings may be available. Contact customer service. mmWave77 high frequency circuit materials are ceramic-filled PTFE composites intended for use in commercial microwave and RF applications. mmWave77 materials exhibits excellent electrical and mechanical properties with a consistent and stable Dielectric Constant and Dissipation Factor over a wide range of frequency (1 GHz to 100 GHz ) and temperature (-40 cº to +120cº). mmWave77 low loss (0.0016 @ 10 GHz values) controlled dielectric materials (+/- 0.05) are available in a broad range of nominal cores and pre-preg. These products were developed to provide unique material solutions for current and emerging RF/Microwave design requirements. mmWave77 RF/Microwave low loss controlled dielectric materials exhibit exceptional dimensional stability, chemical resistance, low moisture absorption, and copper peel strength. ½ oz. (18μm) RTF copper foil. 1 oz. (18μm) RTF copper foil. S7136H is a hydrocarbon woven glass-reinforced ceramic UL 94 V-0 circuit materials present a strong value proposition for today’s designer where cost, performance and manufacturability are paramount. S7136H materials can be fabricated using standard FR-4 printed circuitry fabrication processes. The S7136H materials are well suited for use in Hybrid multi-layer printed circuit configurations and are compatible for use in lead free assembly processes. S7136H materials exhibit excellent electrical and mechanical properties with a consistent and stable dielectric constant and dissipation factor over a wide range of frequencies (1GHz to 20 GHz) and temperatures (-40 ºC to +125 ºC). S7136H low loss, (0.003 @ 10 GHz values) controlled dielectric materials (+/- 0.05) are available in a broad range of nominal cores and pre-pregs. These products have been developed to provide unique material solutions for current and emerging RF/Microwave design requirements. S7136H RF/Microwave low loss, controlled dielectric materials exhibit exceptional dimensional stability, chemical resistance, low moisture absorption, and copper peel strength. SCGA-500 GF220 Ultra Low Loss PTFE Woven Glass UL 94 V-0 circuit materials have been designed for use in many of today’s demanding and highly challenging RF/Microwave design platforms that extend into the millimeter range. SCGA-500 GF220 PTFE Woven Glass Controlled Dielectric Materials provide excellent electrical and mechanical properties with a consistent and stable Dielectric Constant (2.20 Dk +/- 0.02) and Dissipation Factor (0.0009) over a wide range of frequencies (1 GHz to 20 GHz) and Temperatures (-40 °C to +125 °C). SCGA-500 GF220 materials exhibit excellent dimensional stability, chemical resistance, low moisture absorption and copper peels strength. SCGA-500F GF220 Ultra Low Loss Materials are an excellent choice for high volume manufacturing requirements where a balance of cost and performance are of paramount importance.Typical applications include Automotive Radar, Satellite Communications, Filters, Couplers, LNAs, Phased Array Antennas, Power Amplifiers, Avionics and Aerospace. SCGA-500 GF220 materials are compatible with processes used in the fabrication of standard PTFE Woven Glass materials. Based in Dongguan since 1985, Shengyi Technology Co., Ltd. (SYTECH) is a world leader in the development and production of laminates. The company maintains a high commitment to on-going R&D efforts and provides a complete portfolio of products ranging from composites to high reliability, thermal management, HSD and RF/PTFE laminate materials. SCGA-500 GF265 Low Loss PTFE Woven Glass UL 94 V-0 circuit materials have been designed for use in many of today’s demanding and highly challenging RF/Microwave design platforms. SCGA-500 GF265 PTFE Woven Glass Controlled Dielectric Materials provide excellent electrical and mechanical properties with a consistent and stable Dielectric Constant (2.65Dk +/- 0.04) and Dissipation Factor (0.0017) over a wide range of frequencies (1 GHz to 20 GHz) and Temperatures (-40 °C to +125 °C). SCGA-500 GF265 RF/Microwave Low Loss controlled dielectric Materials exhibit exceptional dimensional stability, chemical resistance, low moisture absorption and copper peel strength. Passive Inter-Modulation (PIM) performance values -163 dBc are typical (RTF and VLP type copper foils). SCGA-500F GF265 Low Loss Materials are an excellent choice for high volume manufacturing requirements where a balance of cost and performance are of paramount importance. Typical applications include Base Station Antennas, Power Amplifiers, Phased Array Antennas, Satellite Communications, Telemetry, Filters, Couplers and LNA’s. SCGA-500 GF265 materials are compatible with processes used in the fabrication of standard PTFE Woven Glass materials. SCGA-500 GF255 Low Loss PTFE Woven Glass UL 94 V-0 circuit materials have been designed for use in many of today’s demanding and highly challenging RF/Microwave design platforms. SCGA-500 GF255 PTFE Woven Glass Controlled Dielectric Materials provide excellent electrical and mechanical properties with a consistent and stable Dielectric Constant (2.55Dk +/- 0.04) and Dissipation Factor (0.0014) over a wide range of frequencies (1 GHz to 20 GHz) and Temperatures (-40 °C to +125 °C). SCGA-500 GF255 RF/Microwave Low Loss controlled dielectric Materials exhibit exceptional dimensional stability, chemical resistance, low moisture absorption and copper peel strength. Passive Inter-Modulation (PIM) performance values -163 dBc are typical (RTF and VLP type copper foils). SCGA-500 GF255 Low Loss Materials are an excellent choice for high-volume manufacturing requirements where a balance of cost and performance are of paramount importance. Typical applications include Base Station Antennas, Power Amplifiers, Satellite Communications, DAS and CPE Antenna, Automotive Radar and Wireless Communications. SCGA-500 GF255 materials are compatible with processes used in the fabrication of standard PTFE Woven Glass materials. SCGA-500 GF300 Low Loss PTFE Woven Glass UL 94 V-0 circuit materials have been designed for use in many of today’s demanding and highly challenging RF/Microwave design platforms. SCGA-500 GF300 PTFE Woven Glass Controlled Dielectric Materials provide excellent electrical and mechanical properties with a consistent and stable Dielectric Constant (3.00 Dk +/- 0.04) and Dissipation Factor (0.0023) over a wide range of frequencies (1 GHz to 20 GHz) and Temperatures (-40 °C to +125 °C). SCGA-500 GF300 RF/Microwave Low Loss controlled dielectric Materials exhibit exceptional dimensional stability, chemical resistance, low moisture absorption and copper peel strength. Passive Inter-Modulation (PIM) performance values -163 dBc are typical (RTF and VLP type copper foils). SCGA-500 GF300 Low Loss Materials are an excellent choice for high volume manufacturing requirements where a balance of cost and performance are of paramount importance. Typical applications include Base Station Antennas, Power Amplifiers, Antenna Feed Networks, Passive Components, Telemetry, DAS and CPE Antennas. SCGA-500 GF300 are compatible with processes used in the fabrication of standard PTFE Woven Glass materials.